It has been a decade since Mel Gibson directed his last film. Almost as much time as there was between Braveheart and Passion of the Christ, but in this latest interval Gibson has unfortunately become more discussed for things besides his filmmaking talents. With Hacksaw Ridge, the story of WWII American Army Medic Desmond T. Doss who refused to kill people as a Conscientious Objector, Gibson is very much back in the playing field he seems comfortable with. That said, Gibson seems to have also taken the time away to pull in other influences for his art as many of the early scenes here in which the director develops and builds the character of Doss with actor Andrew Garfield (The Social Network, The Amazing Spider-Man) feel as if they were constructed to be a love letter to Hollywood's golden years. This, of course, deeply contrasts the usually stark and brutal tone that Gibson's films take on, but don't fret as those qualities are sure to come still in Hacksaw Ridge. More, Gibson understands that by painting these early, more serene portraits of where his pacifist of a protagonist comes from he by default makes the bloody and downright horrific war sequences that inevitably take place that much more affecting and that much more powerful. Though somewhat working at odds with one another given how realistically and viscerally Gibson paints his scenes of war with a story that more or less condemns such actions these two elements of what we're seeing and what train of thought we're being encouraged to consider come to work in each other's favors. For as quickly as we see how easily a life can be snuffed out and how faithful Doss has to be to trust that he can "run into the hell fire of battle without a weapon to protect his self," and still survive the point is made that the violence of war is senseless and that, after such an experience, most soldiers would likely agree with such a sentiment. Gibson isn't just making a war film to show off how skilled an action director he is or to revel in the gluttony of violence, but more he is using this profusion of blood and gore to align us more with the mentality that Doss brings to the battlefield and why, despite popular opinion, that might not be such a bad thing. The greatest accomplishment of Hacksaw Ridge though, is that it accomplishes relaying such ideas without preaching them, but instead more by standing with its lead character who stands by his principles even in the great circumstances of a world war. Desmond Doss (Andrew Garfield) falls quickly for nurse Dorothy Schutte (Teresa Palmer). As a Seventh-day Adventist, Garfield's Doss is a man raised in the strict belief he cannot touch a weapon and who observes Saturday as the Sabbath. This doesn't seem to generally interfere much with his day to day life as Doss is a man of simple pleasures in the early years of the forties, but it is after the attack on Pearl Harbor and the enlistment of his brother, Hal (Nathaniel Buzolic), that Doss feels compelled to join his fellow Americans in attempting to defeat the enemy. His father, Tom (Hugo Weaving), is a drunk and a former WWI soldier who saw all of his friends from youth die on the battlefield. He is sternly against seeing the same happen to his sons, but with Hal enlisting without asking for permission and Desmond swearing he will serve as a medic rather than on the front lines the elder Doss can't help but believe the war will not fit into his youngest sons ideas, but more the military will chew him up, use him for what they need at the moment, and spit him back out-dead or permanently damaged. Though the relationship is that of a strained one between Desmond and his father, the tears of his mother, Bertha (Rachel Griffiths), hurt more. Making such a decision even more difficult is the fact Doss has recently met and fallen for a young nurse in the small town in Virginia in which he's from. Dorothy Schutte (Teresa Palmer) is a woman out of Doss' league and he knows it, but there is a charming rapport between the two from the beginning that only increases in affection as Doss pursues a date and then a first kiss with her. The film doesn't care to address in detail how Dorothy feels about Doss' actions once he decides to enlist with the caveat of not being willing to carry a gun, but more it assumes that Dorothy trusts the man she is falling in love with if for nothing else the reasons that he is exemplifying. The chemistry between Palmer and Garfield is quickly solidified as the two create a genuine and deep-seeded trust in one another that can be sensed given the situations they face together, but as soon as this relationship is established and ready to go to the next level, Gibson and his screenwriters, Robert Schenkkan and Andrew Knight, whisk Doss off to war creating another in a line of many stakes that will lend Doss' wartime experiences that much more weight. 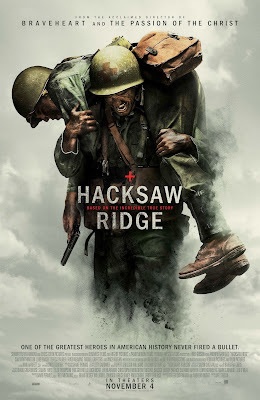 It can seem that Hacksaw Ridge somewhat rushes through the establishment of these stakes though for as swiftly as it presents the self-conflict and the family dynamics it just as swiftly places Doss in the midst of boot camp where he has been assigned to a rifle battalion despite his request to serve as a conscientious objector. It is here though, that Gibson begins to dig more into the ideas and philosophies of his story without overtly listing them off for the audience. More so, Gibson presents alternative perspectives and ideas through that of the surrounding men in Doss' battalion whether it be those who immediately see him as a threat, Sgt. Howell (Vince Vaughn), as a coward, fellow recruit Smitty (Luke Bracey), or simply a waste of time and space, Captain Glover (Sam Worhtington). The screenwriters fill Doss' company with single identifiers that will give our central character lives to attach himself to once they do take the battle field and it is the setting up of those who vouch for Doss, who disregard him, and those that beat him in order to hopefully remove any apparent weakness from their ranks that make the eventual actions of Doss that much more stirring. The bringing together of each of these individual story strands all serve as reinforcement to the blitz of action that begins just over an hour into the film. From that point on through its remaining time Hacksaw Ridge serves as something of a non-stop bloodbath only taking a short intermission in which we acknowledge the acts of Doss before delivering soul-crushing news that lends the aforementioned comment around the senselessness of the violence of war that much more significance. In essence, Gibson has created a violent, cruel, and downright vicious portrait of war that is firmly against the idea of war. In no way does it ever feel the film is glorifying the violence it depicts and never does it paint the soldiers going into battle as heroes, but more as men who come to the end of their rope, fighting for survival, realizing the mentality the military has imbued upon them versus the reality of their situations and understanding it's difficult to find solace in that idea of honor. Never does the large portion of Hacksaw Ridge that is action-packed feel like fun or exciting action, but rather Gibson has intentionally staged these sequences to be as in-your-face as possible not only to reinforce how much danger Doss himself is in, but to really hammer home the horrific mess such fights produce. A woman screamed in terror no less than three times in my screening. I can't imagine as much was an isolated incident. Doss goes before Colonel Sangston (Robert Morgan) in protest that he has a right to choose to not carry a gun. Of course, these thoughts and themes wouldn't come through without the anchor of Doss being there to guide the conversation. Just as important to the formula as Gibson's direction and vision is that of Garfield's performance as he embodies this man who admits and understands he is different from the average soldier, who is something of a nerd in both his lean physical appearance and tendency to favor innocence over intelligence, but who defies all such preconceptions due to the seemingly small feat of abiding by a set of rules and remaining true to those values he swore to himself he would uphold. The point being that in the sense of staying steadfast to one's true self-Doss was undoubtedly the bravest man on the battlefield. To bring this through onscreen Garfield enlists his natural charm and deceitful scrawniness. And for those concerned about his accent it isn't nearly as glaring or distracting as it seemed to be in the trailers for the film, but more it sinks in as just another endearing quality that crafts this humble facade in front of a backdrop of untold complications. It is telling that Garfield as Doss remains largely the same man throughout the picture-no matter his company. Doss is the same man whether he be in the company of Dorothy or his fellow soldiers. Garfield ensures this to be true in each scene as it is vital the audience believes in the characters principals and that he lives by them consistently. This isn't a man who cherry picks what rules of his faith he wants to follow, but rather someone who is all in. This is demonstrated through Doss' commitment in other aspects of his life whether that be in marriage or in serving his country. These elements come together to create one of the more stirring sequences on film this year when, as glimpsed in the trailer, Doss prays to God to please help him get, "one more." It is a scene that in lesser hands might have come off as corny or even hokey, but given Garfield's unrelenting commitment to Doss' unrelenting commitment and Gibson's ability to make the audience believe we're seeing one thing while slyly teaching us another Hacksaw Ridge is truly rousing. An achievement that not only documents a true event by re-creating a story, but by genuinely attempting to show us what happened.